CROSSPOINT STUDENT MINISTRIES EXISTS TO BUILD UP TEENS IN CHRIST THROUGH INTENTIONAL DISCIPLESHIP AND TO CHALLENGE STUDENTS TO SHARE, GROW, AND EXPLORE THEIR FAITH IN A SAFE, CHALLENGING, AND EXCITING WAY. Crosspoint Student Ministries offers a variety of ways for students to grow in their relationship with Jesus as High Schoolers and Middle Schoolers work together to grow in their faith from day to day. Impact (Middle School) and Echo (High School) meet at the same time on Sunday nights to experience foundational teaching and relationship building with our adult leaders. We encourage students to grow through our discipleship programs (primarily for MS group), events, service and student leadership (primarily for HS group) and give them specific avenues to accomplish these things throughout their time in our ministry. Any student that comes to Impact can expect to experience biblical teaching, meaningful worship and others that are passionate about their relationship with Jesus Christ. Impact is our Middle School program on Sunday Nights. Students in 7th and 8th grade are challenged to grow in their relationship with Christ and each other through biblical teaching and intentional discipleship. Impact meets with Echo in the Youth Room (room 206) for worship until the Echo group splits up partway through the night to go to the sanctuary. Any student that comes to Echo can expect to experience biblical teaching, meaningful worship and others that are passionate about their relationship with Jesus Christ. Echo is our High School program on Sunday Nights. Students in High School are challenged to grow in their relationship with Christ and each other through biblical teaching and intentional discipleship which is primarily accomplished through our Student Leadership Prgram. Impact meets with Echo in the Youth Room (room 206) for worship until the Echo group splits up partway through the night to go to the sanctuary. Reverb is a twice a month Bible Study that is more intensely focused than the normal youth group nights. This study takes place after normal youth group from 8:30pm to 9:10pm in room 204. Both Middle School and High School students are invited to attend. Our SLT team is for 10-12th graders that are seeking to grow and experience what it is like to be a leader in ministry. 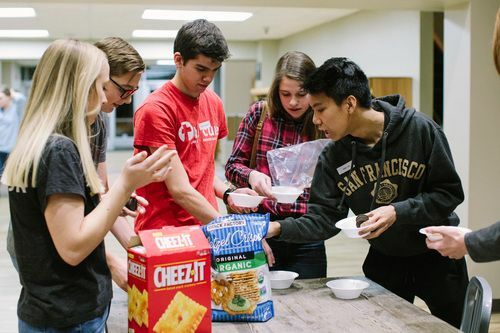 Using intentional discipleship, event planning, leading worship and serving together the SLT gives students an opportunity to grow and develop as a servant leader within the church at large. Discipleship is the cornerstone of Crosspoint Student Ministries! Every student that comes through Crosspoint Student Ministries will be given an opportunity for personal and intentional one on one discipleship both in discipling someone and being discipled by someone. As disciples we don’t simply go through course work we experience what it means to live together, learn together and love as Christ loves us as we engage in ministry with one another. Missions is extremely important to our Crosspoint Student Ministries! Every other year we take a group of High School students to Trinidad for a mission trip where they lead a VBS and some church services at local churches. The next Trinidad trip is taking place June 21-July3. Contact Pastor Josh for details.